Insight Media has announced that Mr. Paul Salvini, Chief Technical Officer, Christie Digital Systems, will deliver the Projection Summit 2012 Keynote Address. The presentation, “What’s Next for ProAV?” will be delivered on Monday morning, June 11th. Projection Summit, held in conjunction with InfoComm 2012, is scheduled for Monday/Tuesday, June 11-12, 2012 at the Las Vegas Hotel (formerly the LV Hilton), Las Vegas, NV. Projection Summit, in its eleventh year, covers projection and other emerging technologies and applications for the ProAV and Consumer Electronics industries. The Summit provides a unique opportunity to learn about the technology and market forces that are shaping the ProAV and consumer markets. The Monday/Tuesday sessions and discussion will focus on key industry trends and issues – matters that will affect business decisions at all levels of the industry. 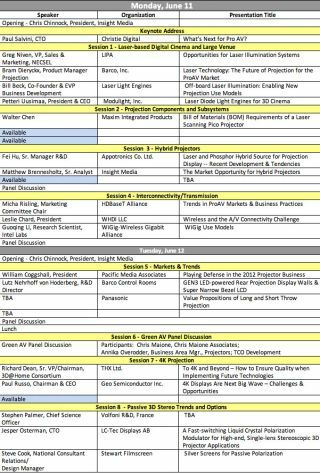 Projection Summit will feature the industry’s business, marketing, and technology leaders from all levels of the big screen display value chain, including Barco, Christie, Maxim Integrated Products, THX, Panasonic, Geo Semiconductor, Stewart Filmscreen and LIPA. PS 12 conference registration includes the Monday/Tuesday Luncheons and one copy of the PS 12 Proceedings. A complimentary exhibit floor pass to the InfoComm 2011 show floor is included.